A couple was ambushed, arrested and detained for 13 hours with no explanation before they learned that the evidence against them consisted of a stack of papers that contained detailed screenshots of posts from their social media accounts. (TFTP) The owners of a tactical supply company were violently arrested and then detained for hours with no explanation while their home was raided by a SWAT Team and their assets were seized—but the evidence used against them by police had nothing to do with alleged illegal activities. In an exclusive interview with The Free Thought Project, Sarah Leach said that she and her husband, Andrew, were ambushed and detained by police for more than 13 hours before they finally received an explanation for their arrest. The evidence the officers claimed to have against them came in the form of a previous error made by state police and a stack of papers that contained detailed screenshots of posts from their social media accounts. Leach said the ordeal began when she and her husband were running errands one morning. After they parked at a strip mall and got out of their car, a patrol car from the Riverside County Sheriff’s Department pulled up and blocked their patch. Two deputies got out and informed the couple that one of the taillights on their car was out. After the pair were violently handcuffed, they spent the rest of the day in police custody, and while they were being treated like criminals, they were given little explanation about what crimes they had committed. During that time, a number of federal agencies worked together to raid the Leach’s home, seizing more than 100 personal items—all of which was obtained legally. “They had allegedly been observing us for about one month, as well as observing Andrew’s elderly parents, a Baptist minister, and a county librarian, possibly the most harmless and docile individuals on earth, who have been dragged into this investigation, which is especially tragic consider Andrew’s father had suffered a stroke only a few weeks ago and has been in healing, just recently able to return to his work as a preacher,” Leach said. Leach said that after she and her husband were arrested, federal agents used the garage door opener in her car to gain access to her house. While the physical damage to the property was small, she said they were traumatized by the fact that the feds raided their home and stole countless possessions after obtaining a search warrant with no legitimate evidence. The Leachs own a tactical supply company in California. 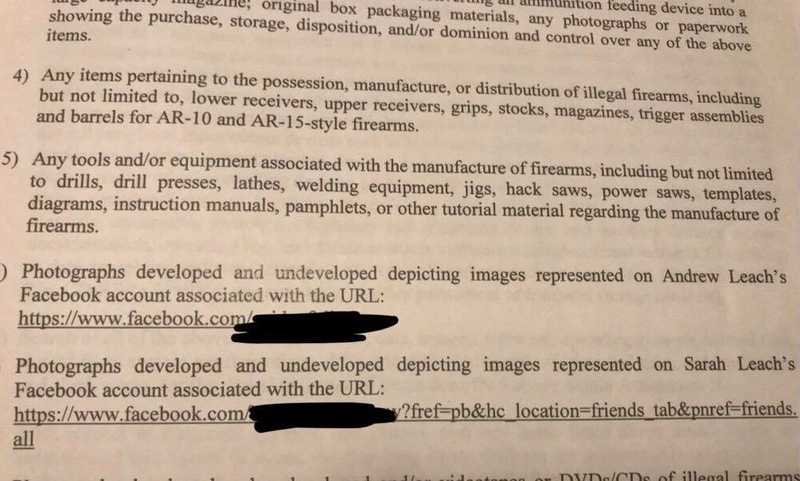 They do not sell firearms, but they do sell parts that can be used by individuals on their firearms, among a variety of other products. Leach noted that the business is completely legal, and follows all of the state’s regulations. While there are cases where police find violent threats online that were posted by suspected gunmen in the days before their attacks, and cases where FBI informants befriend individuals for the sake of convincing them to agree to carry out an attack, the Leachs’ case, is the exact opposite. As Leach noted, the screenshots that were used by police depicted content that questioned the narrative, criticized government overreach and called for police accountability. Instead of advocating for violence or threatening anyone, the posts condemned the violent methods used by the government and police. In response, several federal agencies wasted taxpayer funds to spy on, detain and interrogate an innocent couple. Click here to donate to Sarah and Andrew Leach’s legal fund. There doesnt seem to be enough info. What is their shop called? When looking for reports on this guy its hard to tell what actually happened. Can only find this which seems to somewhat match. Need more info on this one to confirm they arent just drug drealers who are looking for easy money through patreon LOL Sorry. Next court date is in July. 70 felony counts identified for each, 9 felony counts charged each. Two million dollar bond each.